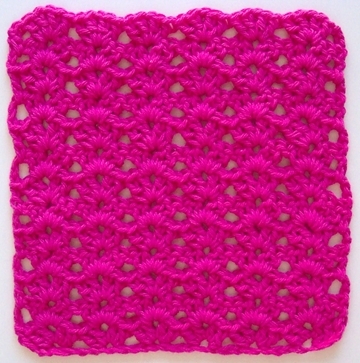 Gauge: 4 Double V stitches - 5 1/2 inches (14cm), 4 rows = 3” (75mm). Measurements: 8 1/2 inches x 8 1/2 inches (215mm x 215mm). Row 1: (2dc, ch 1, 2dc) in the fifth ch from hook (double v-stitch made). *skip the next 3 chs, work double v stitch in next ch. Repeat from * to the last 2 ch, dc in last ch. (6 V-sts). Row 2: Ch 3, turn. (Counts as turning chain and first dc). Work a double V stitch in each ch 1 sp across, dc in top of beginning ch. Row 3–13: Repeat Row 2.